Many people have tried to lose weight through fad diets and while some have succeeded, many have failed due to one main reason: They got hungry. Those hunger pains make it difficult to stick to a diet, which, in turn, makes it difficult to lose weight. So forget the fad diets and diet pills, which can be harmful anyway, and try eating a diet filled with appetite-suppressing foods, like the following 10. They'll not only keep you full, they'll also keep you healthy and looking trim. Tofu is often used to replace meat and poultry in vegan and vegetarian dishes because it's an excellent source of protein, a nutrient that fills you up. Studies show that foods that contain a high amount of protein are responsible for releasing a certain hormone peptide, peptide YY, which causes you to feel full. So don't be afraid to mix a little bit of tofu into a stir-fry or casserole -- it will take on the flavor of whatever you cook it with. Plus, tofu is also low in fat, so it will fill you up without fattening you up. Like tofu, nuts are high in protein and certain types of nuts can also stave off the hunger pains. Pine nuts, for example, release a hormone that releases appetite-suppressing hormones just 30 minutes after you've eaten a meal. Almonds are another nut that can curb your appetite and studies show that they can even help with weight management. Both nuts are also good sources of antioxidants, magnesium and other vitamins and minerals. Fruits and vegetables high in fiber are really great for making you feel full. Apples, bananas, broccoli and leafy greens are among the top high-fiber fruits and veggies that can curb your appetite. For the best results, munch on a bowl of fruit salad for snack or have a small salad before your meal. According to the American Dietetic Association, eating a 100-calorie salad before a meal can decrease your total calorie intake for the meal by 12 percent. Just be sure to use a low-fat salad dressing or a little bit of olive oil and vinegar instead of the full-fat, creamy dressings. Another food high in fiber is oatmeal, which is a great breakfast option. Oatmeal digests slowly, so you should feel full until lunchtime, which will decrease the craving for a mid-morning snack. Oatmeal is also full of antioxidants and complex carbohydrates that stabilize insulin levels. Just be sure to choose steel cut oats or old-fashioned oats as they contain less sugar and preservatives than the instant oatmeal in a packet. Along with protein and fiber, fat is another nutrient that can knock the hunger out of you. Although it may seem a bit backward, it's true. Healthy fats, when ingested, turn into a compound that triggers chemicals in the brain to tell your brain that you're full. These fats, which are polysaturated or monosaturated fats, are also heart-healthy and can be found in avocados, nuts and olive oil. 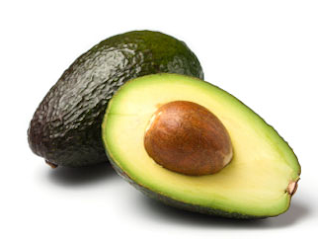 The key with any fat is moderation, so only eat half of an avocado with a meal or have a slice or two on toast. Ever notice how full you feel after eating some mashed potatoes or a few french fries? That's because potatoes contain a certain type of starch that resists digestive enzymes, which slows down the digestive process and makes you feel stuffed for hours after a meal. Potatoes are also a good source of vitamin C, vitamin A and potassium. Fish like salmon, herring and tuna are high in omega-3 fatty acids, which trigger appetite-suppressing hormones. These fish are also good sources of protein, unsaturated fats and vitamin A, vitamin C and vitamin D.
Nuts, avocados and salads can be a bit bland, so spice up your diet with wasabi. The kick and spice might be enough to settle down a hungry appetite. It's a great appetite suppressant and also contains anti-inflammatory and anti-bacterial properties. A common diet-breaker for many people is chocolate but, ironically, it should be part of any diet. Dark chocolate, in particular, contains antioxidants that can combat free radicals as well as high blood pressure and heart disease. Dark chocolate can also suppress the appetite due to its bitterness and steric acid, which slows digestion to make you feel fuller longer. Some studies have even shown that just the smell of chocolate can make you feel full. Ginger root is a great appetite suppressant and can even boost your metabolism. It's also a good source of fiber, amino acids and fatty acids and it also has inflammatory properties. So drink a cup of ginger root tea or eat some slices of crystalized ginger as a sweet treat. For an extra dose of fullness, dip some ginger slices in dark chocolate.